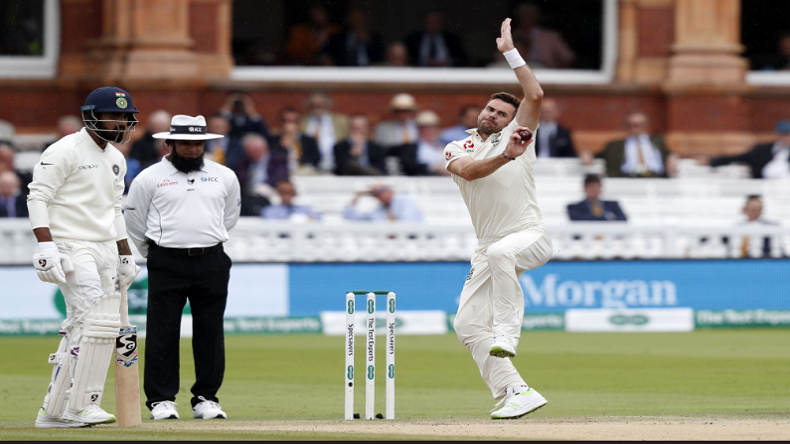 England took the lead by 2-1 in the 5 test match series against India on Sunday as they beat Virat Kohli and men by an innings and 159 runs at Lord's cricket stadium of London. India's got all out in the innings for only 130 runs as James Anderson picked up 4 wickets. He was equally supported Stuart Broad and Chris Woakes, who picked up 4 and 2 wickets respectively. On the Day 4 of the second test match between India and England at Lord’s cricket stadium of London, hosts marked a victory by an innings and 159 runs. The story of struggle ended on the day 4 for team India as they lose the second test of the 5 match series. The English team knocked down all ten wickets of Virat Kohli and company for just 130 runs. For England hero of the match was James Anderson picked up nine wickets. He also completed 100 wickets at Lord’s and achieved another milestone of his career. Just like the first Innings, Indian batting order collapsed like a house of cards. Murali Vijay (00), Lokesh Rahul (10), Cheteshwar Pujara (17), Ajinkya Rahane (13), Virat Kohli (17) Hardik Pandeya (26), Dinesh Karthik (00), Ravichandran Ashwin (33*), Kuldeep Yadav (00), Mohammed Shami (00) and Ishant Sharma (02). Team India was troubled equally by weather (Rain) and English bowlers from the very first day of the Lord’s test, which resulted in another defeat in the test series. Earlier today, hosts declared the innings on 396 runs taking a lead of 289 runs after the dismissal of Sam Curran (40). All-rounder Jonny Bairstow remained unbeaten for 137 runs and created a big challenge for Virat Kohli and men. English batsman Chris Woakes resumed his innings on the same aggressive note and added quick 17 runs against his name, while both the batsmen added 39 runs to the score tally. On the Day 3, Chris Woakes remained unbeaten on 120 runs from 159 balls with help of 18 rolling boundaries. Wicketkeeper-batsman Jonny Bairstow played an important inning of 93 runs off 144 balls hitting 12 boundaries, which helped the hosts to take the lead of 250 runs on the Day 3. Earlier the day, India started on a good note by dismissing the English top order, pacer Ishant Sharma and Umesh Yadav sent Alastair Cook (21) and Keaton Jennings (11) back to the pavilion. While all-rounder Hardik Pandeya dismissed Ollie Pope (28) and Mohammad Shami picked English skipper Joe Root’s (19) wicket with just 89 runs of the scoreboard till the lunch on the Day 3.